While the sins of Judas and Peter were the same, Judas chose to wallow in that sin and eventually kill himself. Tonight we hear in the many gospels that we’ve heard up to now—the six, the first six of the twelve—many different aspects of the story, from the different evangelists who write to us and try to depict the different sufferings that Christ went through. One could speak hours and hours about it, but one thing kind of stood out to me, at least this year, and that is that there are two types of sinners; there are two types of people who commit sin. In this his 400th episode of iSermon, Fr. Ted is invited to give the sermon at the Great Vespers of the feast of the Dormition of the Virgin Mary at Holy Annunciation Greek Orthodox Cathedral in Toronto, Canada. Fr. 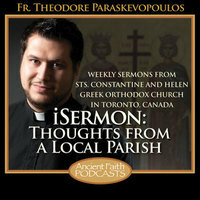 Ted concludes his series on Orthodox life. Fr. Ted examines all of the actions that we do as a Church when someone leaves this world. Fr. Ted explains that the purpose of marriage is union with God. Fr. Ted addresses the sacrament of confession and its healing and communal properties. Fr. Ted discusses what it means to partake of the body of Christ. In this first episode of his new series, Fr. Ted looks at all of the prayers associated with the very beginning of life. The Sunday of St. Thomas reminds us that we are always in danger of losing our faith, even if it is proven to us.